President Barack Obama said Tuesday he remains committed to a campaign goal to flood America's highways with plug-in cars and will ask Congress for new programs to support sales and development of electric vehicles. "With more research and incentives, we can break our dependence on oil with biofuels, and become the first country to have 1 million electric vehicles on the road by 2015," Obama said during his State of the Union address. The president plans to ask Congress to approve a budget that includes improved consumer rebates, investment in research and development and other programs to encourage communities to invest in electric vehicle infrastructure, according to a fact sheet provided to the Free Press by the White House. The automotive industry has been investing heavily in hybrid and electric cars with the support of federal loans and grants and has been making progress towards Obama's goal. Between 2007 and 2010, more than 1.2 million hybrid, plug-in and electric vehicles were sold in the U.S., according to J.D. Power and Associates. But most of those sales are from conventional gas-electric hybrids -- such as the Toyota Prius and Ford Fusion hybrid -- and only a few hundred plug-in or electric cars have been sold. Still, by 2015, J.D. Power and Associates forecasts the number of plug-in and electric vehicles -- such as the Chevrolet Volt and Nissan Leaf -- will grow to about 700,000, or about 300,000 short of Obama's 2008 campaign pledge. Obama's proposal to continue to encourage development of electric cars also reflects a campaign promise he made when he visited Lansing in 2008. U.S. Sen. Debbie Stabenow, D-Mich., welcomed Obama's renewed pledge on Tuesday. "Advanced technology manufacturing is extremely important to our state's economy," she said in an e-mail to the Free Press. "We need to build on this success to create even more jobs." 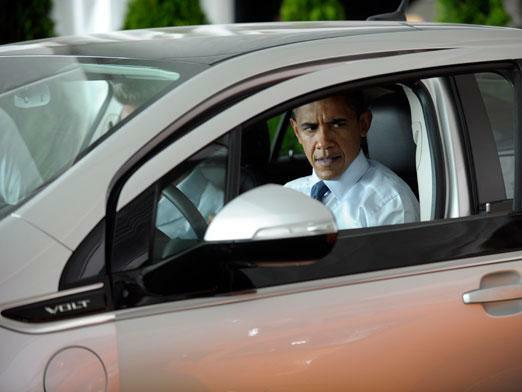 Currently, the Volt and the Leaf are supported by federal tax credits of up to $7,500. The development of hybrid and electric vehicles also has been supported by loans and grants from the Department of Energy. So far, the department has awarded about $8.3 billion out of a $25-billion loan program to Ford, Nissan, Fisker Automotive and Tesla Motors. Loan requests from General Motors, Chrysler and other companies are pending. In 2009, Michigan benefited from a separate Department of Energy program that awarded about $1.36 billion in grants to firms with advanced battery manufacturing plants in the state. U.S. Rep. Dave Camp, a Midland Republican, however, said the federal government should focus on streamlining regulations and energy policies that will create real consumer demand.